Paula has been writing about events and workshops for the Little Rock FGS. She was kind enough to promote one of my workshops. She just wanted the buffet! For some reason, this story just amused me. I found this over on Musings of a Bookish Kitty. This is a restaurant located in a strip mall near the Wal-Mart in Amory, Mississippi. I took it because a distant cousin of mine on my New England Colcord line often goes by the nickname of "MamaT." I wanted to let her know that she had a restaurant named in her honor. Have you ever been angered when you've discovered that someone has forwarded a private e-mail that you went to them without your permission? I think most of us have experienced that feeling. The e-mail was intended for the eyes of only the person to whom it was sent. While I don't think that I've ever had someone forward something that was intensely private and personal, I've often experienced a violation of my privacy, particularly when I've replied to some library mailing lists. For example, a person asks a question and offers to summarize the responses. Instead of summarizing the responses, that person copies and pastes all e-mails received including personally identifiable information to the list. In my book, that is not summarizing responses. It is plagiarizing. Such a practice of distributing an e-mail without the sender's permission is frowned upon by the National Genealogical Society's Standards for Sharing Information With Others. I often forget that my library colleagues don't have such a standards, and I'm quite shocked and appalled when I see an entire e-mail copied and pasted into something that is supposed to be a summary. I've gotten to the point that I often will not respond to queries from fellow librarians. If I had wanted my name to be attached, I would have replied to the list itself. I wonder how often genealogists forget and do the same thing. I've heard of many cases where entire e-mails have been forwarded to others -- sometimes with disastrous consequences. I think the NGS standards are good advice to all persons -- not just genealogists. When a person's privacy has been compromised, they often become distrustful of sharing information with anyone else. They fear that the same thing will happen again. While it has been at least a couple of weeks since I've last had this happen to me on a library mailing list and my response was nothing that I would not have shared with the entire list had the person requesting not offered to summarize the response, I felt violated when I saw my entire e-mail copied and pasted for all to read when an offer to summarize responses had been made. Summary involves analysis of the information to group similar responses. Copying and pasting is not summarization. It is plagiarism. If we as educators expect our students to avoid it, shouldn't we be practicing that as well? At a friend's suggestion, I read John Gray's now classic work Men Are From Mars, Women Are From Venus: A Practical Guide for Improving Communication and Getting What You Want in Your Relationships (New York: HarperCollins, 1992). First of all, I want to admit that I am not a fan of self-help books, but this friend who recommended it was also not a fan of that genre of books. It took quite a bit of convincing to get me to locate our library's copy and check it out. I will have to admit that it was a very insightful look at the differences in the ways men and women communicate and why they so often misunderstand each other. For those who may not be familiar with the book, the author's premise is that men go into their "caves" to solve problems whereas women tend to talk them out. As I began to read the book, I wondered if that is the way that men and women approach genealogical problem solving as well. Do men tend to go off by themselves, find a quiet place, and put the pieces of the puzzle together? Do women tend to talk out the problem by sharing with other friends who are researchers or perhaps just talking through it to the dog or cat if there isn't a human nearby to listen? In my own experience, more of my female genealogical friends have shared the stories of their finds with me. Some have asked what I think; others just want me to listen to the find as they are puzzling it out for themselves. I have rarely had a man do this, although I have had it happen on occasion, but it's usually a much more specific question when a man asks. I really do think men tend to work more "alone" in the genealogical research process just from what I've observed in libraries. Far more women will strike up a conversation about what they are researching in a research room than will men. I see some of both sides of the equation in my own research methodology, but I'm not sure which is the dominant one. Maybe I should ask my cat! So, what do you think? Do men and women approach genealogical problems as Martians and Venusians respectively? I still haven't decided for sure, but I certainly see some evidence that it could be true. Why Did This Have to Be Fictional? I am in the midst of reading Karen MacInerney's Murder Most Maine which was published at the end of 2008. There is a most interesting historical mystery in the story line. It involves a lighthouse keeper who disappeared in the 1840s, a slave bounty hunter, and some "parcels" arriving from South Carolina bound for a Canadian province. There are places in the story where I'm just "itching" to do some genealogical research on the persons in the story. The only thing is that I can't do it, because they are fictitious. I have enjoyed it as the amateur sleuth and the island historian have done the research for me in the available records (such as they are for fictitious people), but it's just not the same as doing it oneself. I love sleuthing out those details! I'm not quite done with this book, but I am enjoying it. As I began to puzzle through the sleuthing aspect of mysteries and genealogical research problems, I began to wonder, "Do all genealogists love mysteries?" When I came home yesterday in these frigid temperatures that we've been experiencing, I was unable to get my garage door to close. After numerous attempts, I finally had to climb atop my car and reach for the emergency drawstring which would allow me to close it manually. The garage door opener is a Sears Craftsman model and had an 800 number on the drawstring. I called that number this morning where I had one of those fun experiences with an automated call answering system. (I hate those things. Just give me a live person who really understands what I want!) When I tried to tell them I needed the garage door fixed, it didn't recognize that term so it finally put me through to an operator. I'm guessing their call center was in India because the person who eventually answered had an Indian accent and was difficult to understand. When I explained what I needed, he was going to set me up with an appointment. They couldn't repair it until February 10--almost a month away. I told him that was unacceptable and that if he couldn't find a date in the next few days that I would just find someone else to fix it. He offered no other dates so I cancelled the service request. I went to the yellow pages and discovered at least 5 companies in the area who service garage doors of all makes and models. I decided to put off the call until I can talk to some folks at church tomorrow to see who services their door openers. One of the companies (according to their ad) even offers same day emergency service -- a far cry from the nearly month-long wait that Sears offered. I know that I won't have to pull that string much longer! I just find it difficult to believe that in these tough economic times that Sears can stay afloat with the kind of service that I received today. I know that if I need service on any of my Kenmore appliances after this that I will not be calling Sears. I also know that I will not be going to Sears to purchase additional appliances. If this is the kind of service that they offer, I simply don't want their product. I recently was cataloging a book of short stories by Guy de Maupassant. I remember reading a couple of his short stories in high school--"The Necklace" and "A Piece of String." One of the stories I encountered was entitled "Graveyard Sirens." In this story, the storyteller is relating a visit to Montmartre. I just want to share a few of the author's words.
. . . Now, I have always liked cemeteries because they sadden and rest me; and I need that influence at times. Besides, many of my friends are laid to rest there, and I go to see them once in a while. . . . I like graveyards because they are such immense, densely populated cities. Just think of all the bodies buried in that small space, of the countless generations of Parisians laid there forever, eternally entombed in the little vaults of their little graves marked by a cross or a stone, while the living -- fools that they are! -- take up so much room and make such a fuss. Cemeteries have some monuments quite as interesting as those to be seen in the museums. . . . I walked slowly along the alleys of graves where neighbors no longer visit, no longer sleep togehter, nor read the papers. I began reading the epitaphs. There is nothing more amusing in the world. Labiche and Meilhac have never made me laugh as much as some of these tombstone inscriptions. I tell you these crosses and marble slaves on which the relatives of the dead have poured out their regrets and their wishes for the happiness of the departed, their hopes of reunion -- the hypocrites! -- make better reading than Balzac's funniest tales! But waht I love in Montmartre are the abandoned plots filled with yewtrees and cypress, the resting-place of those departed long ago. However, the green trees nourished by the bodies will soon be felled to make room for those that have recently passed away, whose graves will be there, under little marble slabs. . . .
How many of us have had similar stories in our graveyard visits? I know that I've encountered some humorous epitaphs and curious wordings on markers. Many of us have similar feelings about the restfulness of cemeteries. The full collection of short stories is available at Google Books. A Google search for the short story and author will bring up this result for you. The story begins on page 311 of the 10-volume-in-1 edition published in 1903 by Walter J. Black. By the way, there is also an interesting story entitled "The Will" on pages 562-565. Source: "Graveyard Sirens, in The Complete Short Stories of Guy de Maupassant. Ten volumes in one. New York: Walter J. Black, 1903, pp. 311-316. The female standing in this photo was my grandfather's sister Marie Lantz (who later married Grover Hosmer). 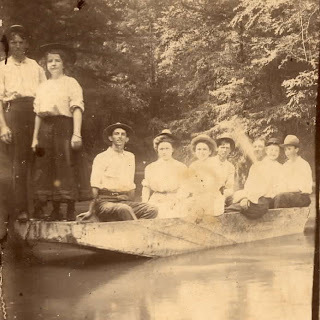 I suspect this photo was taken in the mid-1910s in Monroe County, Mississippi, probably near Aberdeen. I have no idea who the others are or what the occasion was. This was submitted for "Smile for the Camera." According to The Nation's Report Card: U.S. History, 2006, only 36% of high school seniors could identify immigration pattern and explain its causes. I would think that studying genealogy and family history could improve this score. I just hate to see students doing so poorly in history. Web 2.0 applications have been all the rage for some time. One of the most successful applications is LibraryThing. At free for up to 200 books, $10/year, or $25 for a lifetime of cataloging, it is a great bargain. There are a lot of ways genealogists are using this tool. The most obvious use is to catalog the books in one's personal library. With the ability to import records from hundreds of worldwide bibliographic tools, it takes only your imagination to find a library catalog that might have that resource in your hand so that you don't have to catalog it manually. For example, I had a publication that I had picked up at a genealogical conference that was published in Ireland. I found a library in Ireland that had that title in their collection and used their record. I will admit that there are titles that I have that are pretty unique. I have had to enter these manually. Since I'm a cataloger by profession, that doesn't bother me. However, I know that I tend to be pickier about my cataloging than others are. Instead of subject headings, one can use tags to identify the books. Many people also tag locations of their books such as "shelf 16" or "box 22". LibraryThing also gives one the ability to add reviews of items. If we genealogists used these reviews to their full potential, we could really keep up with strengths and weaknesses of various titles. In my experience, reviews are more honest on LibraryThing than at Amazon.com. One of my favorite features of LibraryThing is the ability to find similar libraries. I have found many fellow genealogists using these. I add them to my friends, to my "interesting libraries," or to my "private watch list." That way I receive notifications of additions they make to their libraries. I'm able to find some titles of interest this way and often order them or add them to my wish list. I don't know of many genealogists who use LibraryThing for their wish list, but I do know there are a lot of users who do and use the tag "wish list" for the items that aren't in their library. LibraryThing really would prefer that folks only use LibraryThing for things they own or have read. Many of us use it for things we have read but do not own. I typically use the "NIL" (not in library) tag that many other LibraryThing users for these items and then add a location code for them. I have tags for books borrowed from friends and for books borrowed from libraries. They probably mean nothing to most people, but they mean something to me. Then we have the "thinking outside the box" type of LibraryThing user. One of my genealogist friends has taken the various journals in his library and entered each article as a title. He uses the tags he has devised to easily locate articles in his personal collection. It's kind of like a PERSI index that is limited in scope to the journals in his own possession. The more and more I see his entries, the more and more I'm tempted to do the same thing for some of mine. I tend to forget about those lists of insolvents and transcribed censuses of schoolchildren that appeared in various issues of journals, but they are tools in my library that I could be using more often if I included them in my LibraryThing catalog and tagged them. LibraryThing also has groups, but most of the genealogy groups are not very active. Do you use LibraryThing? Do you have any special way of using it? J. M. Bell over at Boston 1775 alerts us to a request for help finding an old sampler. The original request for help is from Independent Needlework News. This looks like an interesting challenge! I went to both the North Carolina State Archives and the North Carolina State Library on my trip to Raleigh this past week. I had a listing of documents that I needed to get from the archives and files at the Archives. As I began to look, I was having a time finding one document as it was cited. It was getting near the end of the time I was spending there that day, so I decided to run to the library and double-check the citation before returning to the archives the next morning. I discovered that I had not really written down anything incorrectly so I went back upstairs and began looking around the microfilm room again. Those numbers for the film just didn't seem to correspond to anything in the room. I finally went up to the desk. They immediately recognized that number as an "old" number. Apparently someone had gone through and renumbered that portion of the archives at some point since the book had been published. One of the ladies who had worked in the archives a long time ago was able to find the originals which had the new number as well as the old on it. They also had a note saying they were too fragile to use and that the microfilm should be used. When they checked their finding aids, the number that was listed corresponded to something else. I'll make a long story short at this point and say that we finally located the film about an hour after I'd begun looking that morning. I was able to get my copies of the records I was seeking and several other colonial period items that I was seeking. After discovering that it took the archivists that long to find that item, I didn't feel so badly that I'd had trouble finding it! I suspect there are other who have stories about difficulties finding items after finding aids have been published when archives renumber items. I recall hearing about archives being renumbered a time or two when I've been in sessions at some of the national conferences. It would be nice if they made some sort of note to stick in the front of the published books in the state library so that those using those records will know the new classification the archives is using for the items instead of spending all that time trying to track them down!